These engine bearings feature an H-14 overlay material on a high strength steel backing for unsurpassed durability. Sealed Power Speed-Pro brand builds engine bearings using materials and alloys engineered for demanding applications. Speed-Pro tailors there bearings to withstand punishing racing conditions. Federal-Mogul's Speed-Pro bearings are proven winners in NHRA, NASCAR and IHRA competition. Sealed Power's Speed-Pro engine bearings include a patented contoured-flange design that increases thrust-load capacity and a three-quarter-length oil groove that enhances lubricity without compromising load capacity. 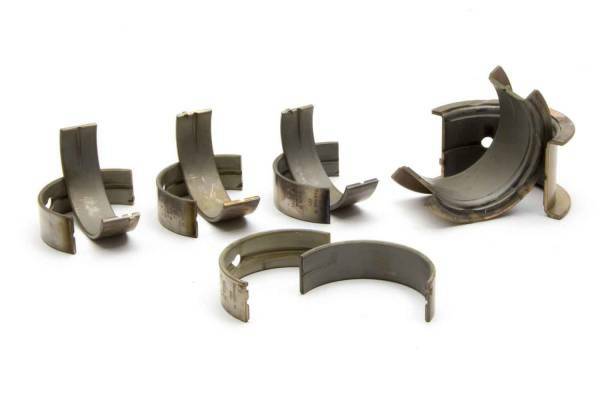 The materials in Sealed Power's Speed-Pro bearings offer a variety of advantages, such as high durability, corrosion resistance, decreased rate of wear and increased fatigue strength. These advantages are all essential features for performance engines that need to withstand punishing racing conditions. Sealed Power's Speed-Pro DUROSHIELD Competition Series Coated Bearings provide protection against dry starts and conditions that interrupt oil supply. Speed-Pro’s H-14 Super Duty Alloy has the greatest load-carrying capacity. Sealed Power's Speed-Pro H-24 Alloy is notable for its desirable fatigue resistance and strength. Sealed Power's Speed-Pro B100 babbitt material is used in ultra-high-performance rod and main bearings for blown-fuel and alcohol engines that require high “embeddability” and conformability. When Selecting bearings, engine builders commonly focus on getting the proper clearances and maintaining adequate oil pressure. Durability is expected from any bearing that is chosen, and the advantages of different lining materials may not be considered. When an engine's operating conditions are considered, and bearing materials are chosen accordingly, the likelihood of success is greater. In street driven applications there are a number of materials that will do an excellent job. Each material has advantages in terms of resistance to corrosion, rate of wear, and fatigue strength. The latter characteristic is most critical in racing engines that operate under high loads, generate considerable heat, and may be subjected to occasional detonation. No bearing can withstand detonation, but the use of superior materials can improve the bearing's load carrying capability. Federal-Mogul / Sealed Power's heritage of industry leading technology is reflected in the Sealed Power and Speed-Pro engine bearing product lines. Sealed Power's offers unique materials and alloys engineered for demanding applications. Speed-Pro engine bearings are specifically tailored to withstand punishing racing conditions.